The ethanol stress response in ethanologenic yeast during fermentation involves the swishing of several adaptation mechanisms. In Saccharomyces cerevisiae, the Jac1p and Isu1p proteins constitute the scaffold system for the Fe–S cluster assembly. This study was performed using the over-expression of the Jac1p and Isu1p in the industrially utilized S. cerevisiae UMArn3 strain, with the objective of improving the Fe–S assembly/recycling, and thus counteracting the toxic effects of ethanol stress during fermentation. The UMArn3 yeast was transformed with both the JAC1-His and ISU1-His genes-plasmid contained. 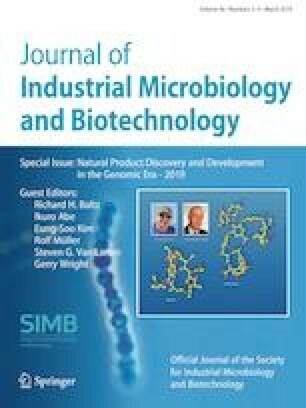 The Jac1p and Isu1p His-tagged proteins over-expression in the engineered yeasts was confirmed by immunodetection, rendering increases in ethanol tolerance level from a DL50 = ~ 4.5% ethanol (v/v) to DL50 = ~ 8.2% ethanol (v/v), and survival up 90% at 15% ethanol (v/v) comparing to ~ 50% survival in the control strain. Fermentation by the engineered yeasts showed that the ethanol production was increased, producing 15–20% more ethanol than the control yeast. The decrease of ROS and free-iron accumulation was observed in the engineered yeasts under ethanol stress condition. The results indicate that Jac1p and Isu1p over-expression in the S. cerevisiae UMArn3.3 yeast increased its ethanol tolerance level and ethanol production by a mechanism that involves ROS and iron homeostasis related to the biogenesis/recycling of Fe–S clusters dependent proteins. The online version of this article ( https://doi.org/10.1007/s10295-019-02175-5) contains supplementary material, which is available to authorized users. This study was funded by the Consejo Nacional de Ciencia y Tecnología (CONACYT) of México (Grant number 256119) and by a Universidad Michoacana de San Nicolás de Hidalgo/C.I.C.2.14 Grant. We thank E. Craig for plasmids donation.